Dudon is a Dopamine antagonist. Because it does not readily enter the central nervous system, its effects are confined to the periphery and acts principally at the receptor in the chemoreceptor trigger zone. 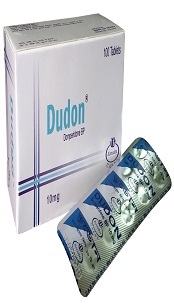 Note: Dudon tablet & suspension should be taken 15-30 minutes before a meal. For acute nausea & vomiting, maximum period of treatment is 12 weeks. Domperidone may produce hyperprolactinemia (1.3% frequency). This may rasult in galactorrhea , breast enlargement and soreness and reduced libido. Dry mouth (1.9%), thirst, headache (1.2%), nervousness, drowsiness (0.4%), diarrhea (0.2%), skin rash & itching (0.1%) may occur during treatment with domperidone. Extra-pyramidal reactions are seen in 0.05% of patients in clinical studies. Domperidone should be used with absolute caution in case of children because there may be an increased risk of extra-pyramidal reactions in young children because of an incompletely developed blood-brain barrier. Domperidone is contraindicated to patients who have known hypersensitivity to this drug and in case of neonates. Domperidone may reduce the hypoprolactinemic effect of bromocriptine. The action of Domperidone on Gl function may be antagonized by anti-muscarinics & opioid analgesics.